In Kenya, a new coalition of opposition parties hopes to unseat the ruling Jubilee Party in the country’s general elections later this year. 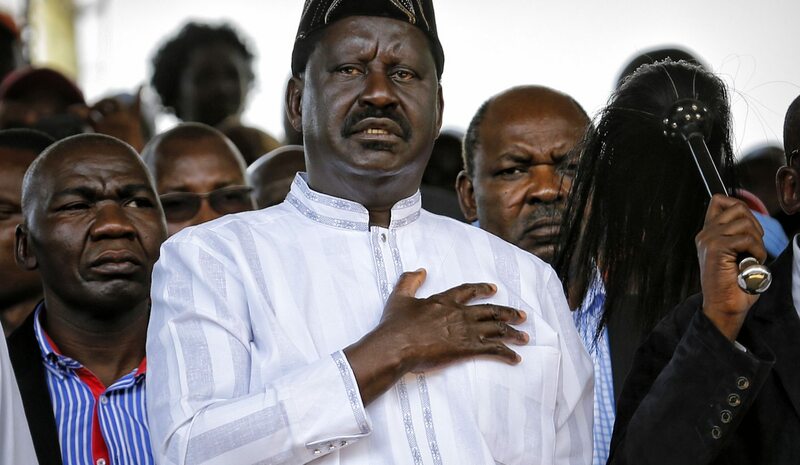 But critics worry that veteran opposition politician Raila Odinga – who has contested four presidential elections, and lost all of them – is not the man to lead the new coalition to victory. By NJERI KIMANI. With Kenya’s general election fast approaching – the vote is scheduled for August 8, 2017 – Kenya’s politicians are doing everything they can to position themselves for a successful tilt at the presidency. Last year, the country saw the birth of a new political party, the Jubilee Party, as President Uhuru Kenyatta sought to consolidate his grip on power. This year, it is the turn of the opposition, which earlier this month unveiled a brand new coalition: the National Super Alliance. The coalition consists of six major political parties, with 15 others lined up to join later. The main parties are the Orange Democratic Movement (ODM), the Wiper Party, Amani National Congress, Chama cha Mashinani, the Narc Kenya Party, the United Democratic Party and the Muungano Party. Launched in early January, the coalition displays a rare kind of unity among the opposition, last witnessed in 2002 when the opposition formed the National Rainbow Coalition in an unsuccessful bid to unseat then-President Daniel Arap Moi. But it’s a fragile unity. Tensions are high within the new coalition because it has yet to anoint a presidential candidate; unlike the Jubilee Party, which has already endorsed President Kenyatta for a second term. For the alliance, there are four main candidates in the running: ODM’s Raila Odinga, Wiper’s Kalonzo Musyoka, Ford Kenya’s Moses Wetangula and Musalia Mudavadi from the Amani National Congress. Of these, Raila Odinga is the most high-profile, having narrowly lost all four of the last elections in which he participated. But some opposition supporters feel that his repeated losses prove that he doesn’t have what it takes to beat Kenyatta, and that he needs to pass on the baton to a younger man. “The youth, especially in opposition, feel that there is a need for creating space for younger leaders who are seeking the presidency. The fact that he continually blocks people from going for the seat makes him a big stumbling block and influences the voting pattern greatly to his advantage,” said Joseph Omondi, a political analyst from Nakuru. Omondi says that the coalition’s clearest path to victory is to encourage better voter registration and turnout, which is poor in the opposition’s stronghold areas. “The opposition pulls crowds, but on voting day many do not show up for the exercise. In fact, analysing figures, these regions record some of the lowest numbers on voting day. To win they need to urgently energise their base which historically had relatively poor registration and voter turnout,” he said. Other commentators worry that the coalition’s focus is too narrow; that it is too reactive to the actions of the ruling party, rather than developing policy and tackling issues that affect the country. Busia Governor Sospeter Ojaamong claims the coalition will lose as it continues to focus narrowly on capturing the seat from Jubilee instead of encompassing issues affecting the country. “They should shift their focus from criticising and insulting Jubilee but instead focus on real issues that are irking Kenyans. It is problems like insecurity, joblessness, poor healthcare that are forcing Kenyans to seek a change in the regime and it’s time the coalition realised that,” said Sospeter Ojaamong, governor of Busia County and a senior ODM figure. Kenyans will have to wait and see whether the new coalition generates sufficient voter numbers to defeat Jubilee at the polls. With a voter registration drive currently under way, both the alliance and Jubilee are locked in a mad stampede for new voters, especially in potential swing areas like the Coast and the Rift Valley. For the alliance to succeed, they will have to elevate themselves above the blunt logic – and mathematical difficulties – of tribal politics. But this won’t be easy.